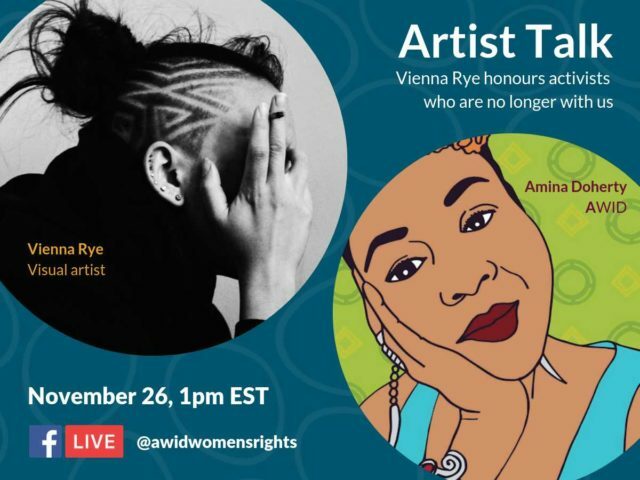 Join us for a conversation with Vienna Rye, the visual artist we have worked with this year on a beautiful Tribute that honours some remarkable feminists and activists who have died this past year. She’ll share what inspired her creations and give a sneak peek to the artwork she has created, which will be released on November 29, Women Human Rights Defenders Day. Artist Talk: Vienna Rye honours activists who are no longer with usJoin us for a conversation with Vienna Rye, the visual artist we have worked with this year on a beautiful Tribute that honours some remarkable feminists and activists who have died this past year. She'll share what inspired her creations and give a sneak peek to the artwork she has created, which will be released on November 29, Women Human Rights Defenders Day.